A recent rainstorm meanders away from the low-hanging sun in the sky and the soggy ground gives way to the first flowers. The rainy season has only just begun. If Beltane is meant to celebrate the middle-most height of spring, you certainly wouldn't know that at my Midwestern home. We saw snow and sleet in mid-April, paired with record lows and wind chill numbers enough to make you think we were nearing the winter solstice more than May Day. I shouldn't complain though; Kansas City summers are scorching and stifling. This is a welcome pause in the extremities of temperatures. At 8:13 this morning, we marked the official cross-quarter holiday between the Spring Equinox and Summer Solstice: May Day. We erect May Poles from flowers and ribbon, dancing about them to symbolize love, happiness and fertility. Bonfires created on this sabbat are used to rekindle the hearth fire of the home. As the holiday across from Samhain on the Wheel, Beltane marks the other time of the year where the veil is thin. For this holiday, however, we focus more on the other that ventures through the veil: The aos si, the daemons and the Fae. For this altar, the only non-natural items used were the glass and edible sugar-based glitter. While the latter is technically just sugar, I'm including it in the non-natural category because you can't just go out and get edible glitter from the wild. The latter was difficult to work with thanks to natural humidity. It wanted to clump together and didn't originally look like the kind of glitter I wanted. However, with a little flour, a marshmallow and some patience, I was able to create the kind of loose, powdery consistency I needed for this altar. I also sat a deer antler at the front of the altar. Though it's not part of the main altar, it was an important piece of representing May Day. Deer are often seen as highly spiritual, kind and proud. Their antlers invoke a projective energy. With this, I was protecting the altar and its potential visitors. I began by pulling some flowers from around my house. Flowers included indigo-colored hyacinth, standard daffodils and pink Amaryllis Belladonna, commonly known as "Naked Ladies." Admittedly, I felt a bit guilty plucking the few that had sprouted. I made sure to give egg shell and coffee ground offerings to the area, but the guilt persisted. These flowers were some of the first food for bees. What would they eat? This became the base theme for my altar over the course of the next ten minutes. Pictured above in detail, the indigo hyacinth is commonly associated with spirituality, sincerity and forgiveness. The latter perked my attention, especially as the regret gnaws at me. The name "hyacinth" comes from a Greek legend involving Hyakinthos. As Apollo taught the young man how to throw a discus, Zephyr became incredibly jealous. God of the west wind, sent a strong wind that threw the discus into Hyakinthos's head, killing him. Apollo felt responsible for the death of his friend and, from his blood, created a flower in honor of Hyakinthos. As I felt guilty for plucking the first flowers of spring and removing much-needed food for bees, I thought of this tale. I placed one hyacinth at the center of the altar, asking for forgiveness for removing the flowers, and plucked the individual buds to form a circle around it. Naked Ladies are a lily that pops up in early spring only to wilt, giving way to another, taller blossom at the end of summer. The technical name for lily, amaryllis, comes from the Greek story of a shy, young nymph who fell in love with a stoic shepherd. This shepherd demanded of the nymph a flower he had never seen before. The Oracles of Delphi told her to pierce her heart with a golden arrow at the shepherds door. Out of pure devotion and love, the nymph Amaryllis did so and, from her blood, the lily was born. The color pink lends itself to the same traits Amaryllis showed - love, devotion, compassion - but also nurturing. As I built the altar by placing the tiny buds of amaryllis belladonna between the hyacinth, I began to think of what ways I could possibly nurture the bees I felt I was stealing from. In the center of the altar, I placed a few bright daffodils to add a pop of color. With yellow and purple being complimentary colors, the two stood out against each other. While the original myths surrounding daffodils vary and are questionable, this flower undoubtedly symbolizes the first of spring, the rebirth of the land and brand new beginnings. The bright yellow associated with daffodils offers correspondences of happiness, inspiration and communication. By adding the daffodil to the altar, I'm invoking polite communication that I'm willing to nurture the bees. At this point, I boldly stating to the bees: Please forgive me for taking the first flowers of the season for this altar. In exchange, I am offering something of nourishment gifted in love and in happiness. Originally, I had brought in my box milk to add to a glass for the fae. While the fae were still in the forefront of mind, I also wanted to take the bees in to account. Besides, fae often disguise themselves as small flying bugs, so the offering would still go to them. Running back inside, I created a mixture 2:1 of water and sugar in the cup. 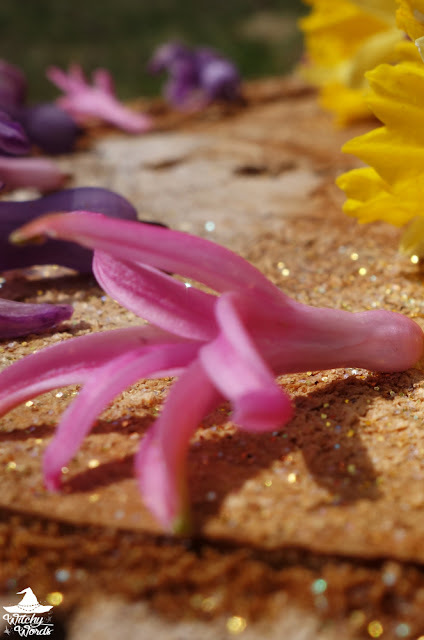 Once outside, I added a bit of edible glitter (which almost instantly dissolved into the water) as an offering for the fae, and a large hyacinth bug for bees to land on. This mixture of sugar and water is a common way to hydrate and revitalize bees during the hot season. Multiple bees came to feast on the flowers and water offered. Some of them, I thought, glittered just a bit before they landed - an sign of a fairy in disguise. I had one particular moment with a ladybug who did the same as well. My altar was a success, creating a nurturing landing pad for fae and bee alike. I will say: Taking pictures of bees when you're allergic is every-so-slightly terrifying. But my allergy need not dictate who I help - just that I use caution in doing so. And so my altar for the fairies and bees for May Day was complete. Enjoy the picture below relaying the correspondences! I hope everyone had a blessed May Day!